Melissani where the water of the lake creates turquoise reflections on the walls of the cave. environment, while being less than 100 meters away from the Skala’s famous Beach and a 10 minute walk away from the centre of the village. and it still is a pole of attraction for tourists from Greece and from all over the world. 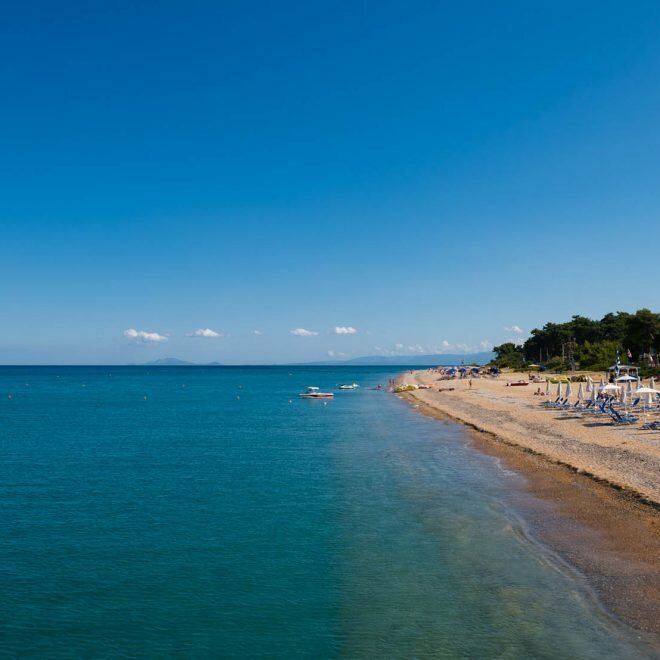 Facilities on the beach include a snack bar, sunbeds and parasail hire, showers, W.C'S and telephone. Whilst development is restricted within the beach vicinity, there are a couple of nice Tavernas at the start of the access road down to the beach in Divarata. Assos is one of the most beautiful and picturesque villages of Kefalonia. It is built amphitheatrically around the peninsula with steep slopes crossed by a narrow strip of land where the Venetian castle stands, another thing that makes this area famous. There is a small beach at the centre of the village making the area look more like a lake because of its geographic nature. The water is shallow and the bottom is paved with large pebbles. In the village you can find a variety of shops and taverns also you will notice that the houses are built with traditional architecture and are covered with bougainvilleas filling the place with a heady aroma. Here in Assos you can hire boats enabling you to explore the many small coves and beaches only accessible from the sea. Fiskardo is a picturesque village in the northern part of Kefalonia. It links the island, by boat to Lefkas, Ithaca and Astakos. Fiskardo is the only village that remained virtually intact after the earthquake of 1953 and so it has kept the traditional architecture of the island. The area was declared a historical site and preserved as such giving the impression that time has stopped. It is one of the most cosmopolitan parts of the island with celebrities both Greek and foreign visiting the area. The large marina accommodates many boats and Yachts. And there is the chance to explore the beaches around that are only accessible by boat. Melissani cave is located close to the town of Sami, about 20km from Argostoli, the capital of Kefalonia. It is without a doubt one of the most significant places for tourists to visit in Kefalonia. Surprisingly there is a lake inside the cave that has trees and forests surrounding it. The sight is simply magical. The cave itself has the shape of a B with 2 chambers separated with an island in the middle. The roof of one of the chambers has caved in centuries ago letting the sunlight shine into the lake and making it a breath-taking sight. When the sun is right above at noon, the sunlight hitting the turquoise-blue waters create a magical illusion and the whole cave of Melissani suddenly fills with blue light. At noon is the best time to visit the cave and enjoy a relaxing boat-ride with a traditional boat at the lake. The cave of Melissani is 36m high, 40m wide and 3.5m long. Near Argostoli, on the top of the hill in Perata, is located the Castle of Saint George. It was built on the 12th century BC by Byzantine emperors. It occupies a total area of 16 acres, while the perimeter of the walls is 600 meters. Visitors can admire the outer walls of the castle, churches and several buildings, and what is left of a bridge that connected the ramparts inside.